This page features case studies highlighting my marketing consulting work. I specialize in social media marketing, SEO, website administration, blogging, email marketing and press release creation and distribution. I co-manage the Carol Roullard Art Facebook page. Facebook has been a great marketing tool for up and coming artist Carol Roullard. We drive engagement by posting new content regularly and asking followers for their opinions on existing and possible new works by the artist. Likes climb daily as does reach. Broke in the OC started off as my own personal experiment while I was looking for a job fresh out of college. The account’s number of followers increases daily as a result of starting conversations within my niche, frequent posting and relationship building. Family-run app development studio Startled Monocle needed to get the word out about their games. Per our app marketing and publicity plan I crafted press releases to suit their various announcements and distributed each release to researched sites. 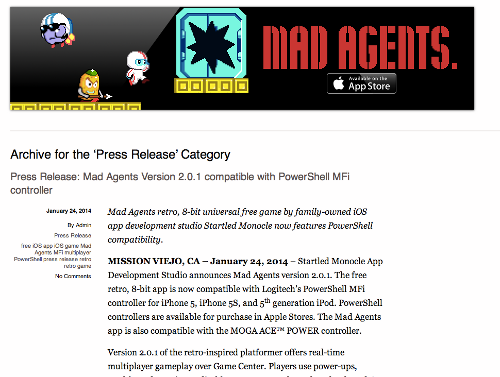 Their game Mad Agents received a substantial amount of publicity as a result of press release announcements. This resulting press lead to interest from leading publishers in the game’s sequel. We all have those friends or family members who are super into pop culture and can tell you exactly what antics Miley Cyrus has been up to of late, the perfect Snapchat selfie lens to make you look like a bug-eyed fairy, and which weird Instagram account is “totally blowing up.” I’m talking about your tween niece or your always stylish and perky happy hour buddy. Whether you love it or hate it, they keep you in the loop, right? We’re a month into 2016 now and I hope your new year has been going strong. If you feel like your marketing efforts could use a little juice, you’ve come to the right place. Check out these online resources for amping up your marketing in 2016 from the top marketing companies out there. HubSpot and LinkedIn recently released some very interesting joint literature titled The Marketing Skills Handbook – A Deep Dive into Today’s Most In-Demand Marketing Jobs. Why does this concern you? Because you may be a company looking to hire a marketing professional, a marketing professional yourself or you’re just curious (as you should be). Read on, friends, for an overview and some of my own opining. Hi, I'm Sarah Le, a freelance copywriter and marketing consultant based out of Orange County, California. I started Hi Vista Media back in 2010 to help small businesses build a web presence. Check out the About page for more information on my background and the foundation of Hi Vista Media. Contact me today to chat about your brand and how we can take it to the next level. Visit the Contact Me page to get in touch.